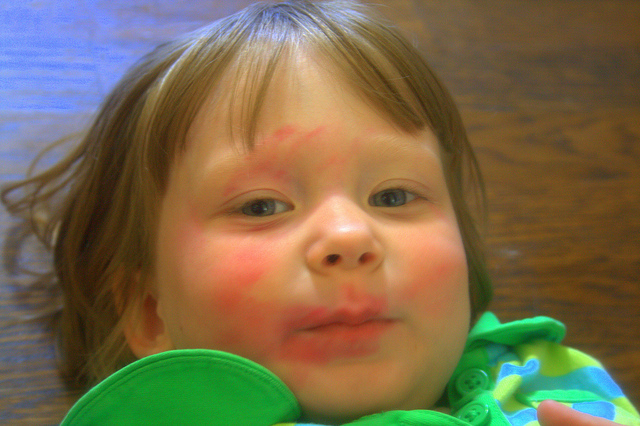 This week we asked: What do your toddlers in trouble look like? Laura blogs at Our Messy Messy Life. Shannon blogs at Pineapples & Artichokes. Stacy blogs at Little graham cracker. 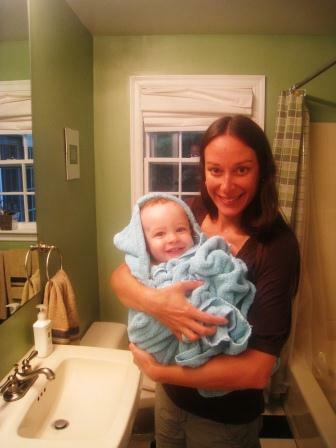 Leah blogs at Zen and the Art of Cloth Diaper Maintenance. Joshua’s mom Abbie blogs at Farmer’s Daughter. Charise blogs at I Thought I Knew Mama. Julia (2) caught in the act. Valerie blogs at Momma in progress. Well… she thought she was in trouble. Jorje blogs at Momma Jorje.com. 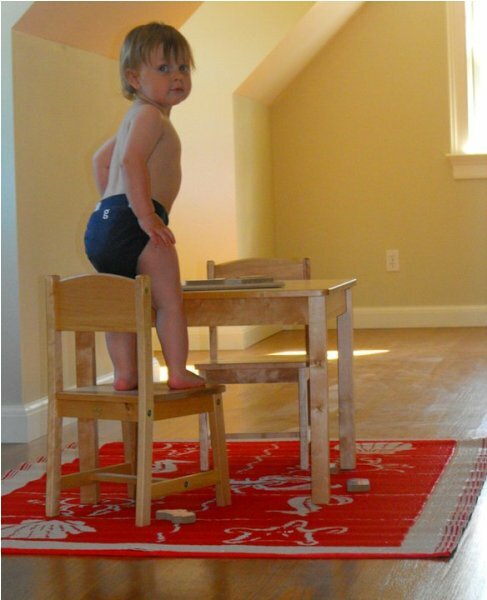 Tell us: What do toddlers in trouble look like in your family? I totally agree! Those “guilty” expressions are so freaking cute! Oh my! These are so funny. Samuel(15months) has been writing on the kitchen floor with washable marker lately, wish I could’ve caught him in the act. Ha Jorje – so true 😉 These are great, and it’s obvious from the pictures that the parents were good-natured about any messes made! 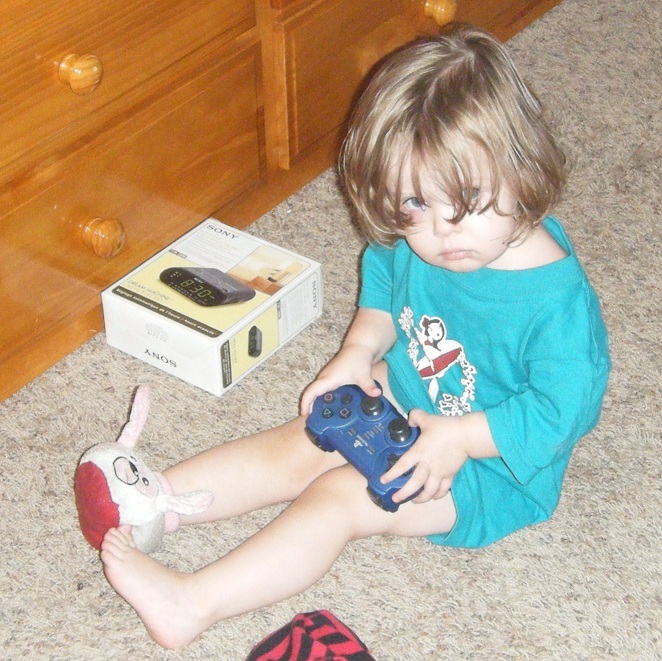 I definitely think I’ve mellowed compared to when Tyler was this age. 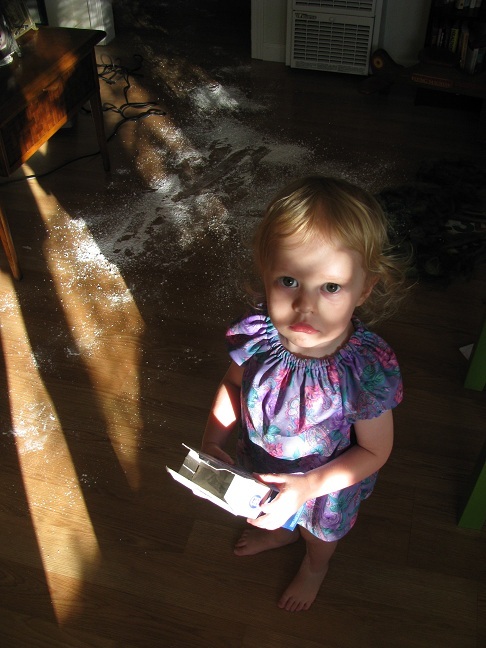 I wish I had a photo of her with baby powder, though. I noticed her hair looked lighter one day, she’d been making it “snow” in her room! She even had little snow mountains on shelves! I couldn’t be too mad even then, it was simply too funny! These are so funny – although it’s easier to laugh at seeing the photos and not being the one that has to clean up the mess afterwards! 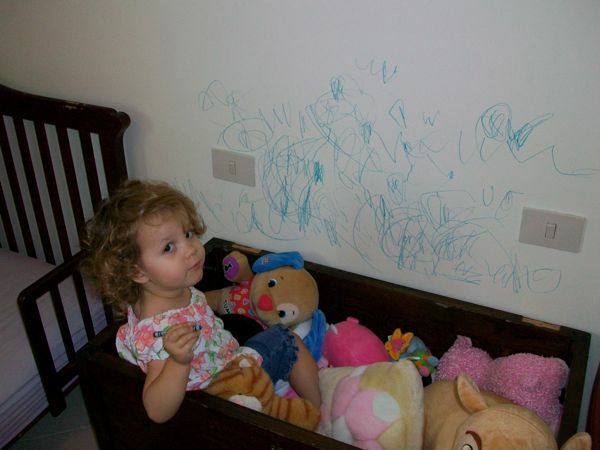 What they all seem to have in common is just how QUICKLY toddlers can find themselves in trouble. The petroleum jelly one made me especially laugh as my brother did this when he was younger – he smeared a giant size tub of it into his hair and it took about 10 washes to get his hair back to normal! I linked up my post of my toddler drumming – not trouble, just loud! 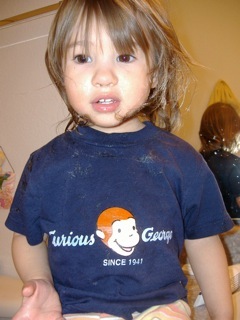 Yes, Terri, it took forEVER to wash out! We were actually leaving on an 8 hour road trip an hour after this! I don’t think I got it all out the first time, haha! These are great pics. 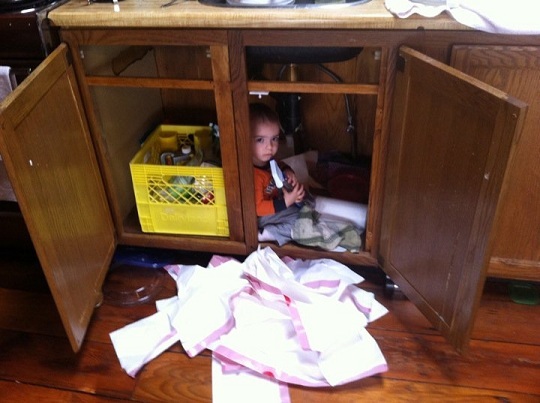 I love how the first thing all these parents thought to do when their toddler got in “trouble” was to take a picture. These are hilarious!! What a great idea for a theme! I want more. 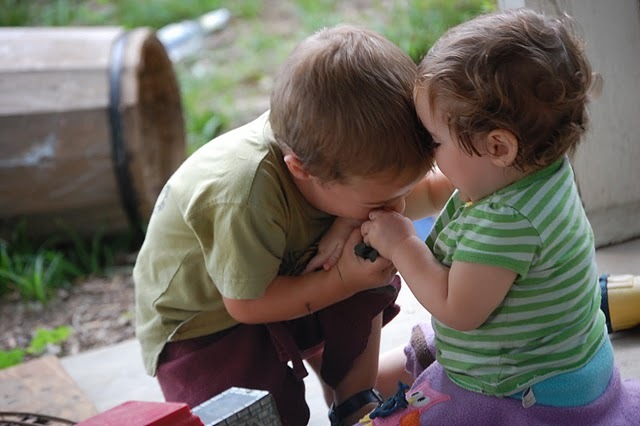 somehow they always seem to look cute , even when they are naughty… must be natures way to keep us from eating our young! heheehee. Nice to see I’m not the only one whose first reaction is to get the camera. I will love showing my kiddos these types of photos one day.